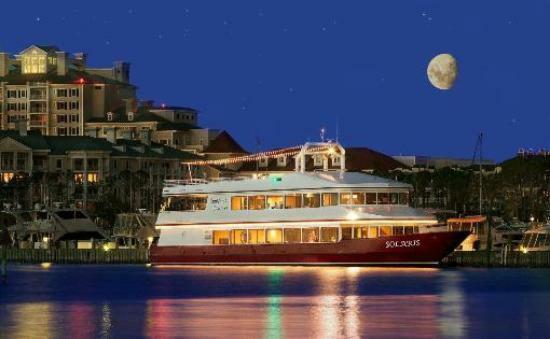 Guests on the SunQuest dinner cruise will board the Solaris, a world class yacht with three decks. With room for 150 people and abundant indoor and outdoor seating, the Solaris is perfect for weddings, rehearsal dinners and other events. Highlights of the Solaris include the open air Sky Deck on the ship’s third level and the large dance floor on the main deck. Every cruise includes live music, which can be heard on all three of the yacht’s decks. As the sun sets, guests can sip martinis, tropical drinks or wine from the ship’s full service bar. After enjoying a cocktail or two, the Solaris’ passengers sit down for an elaborate dinner. Freshly prepared onboard by the ship’s renowned chef, this three course meal features the finest ingredients from the land and sea. With Sautéed Gulf Shrimp, Seared Lemon Rosemary Chicken Breast, Southern Style Crab Cakes and many other entrees, there is something that appeals to every palette. Coffee and tea are served at the end of the meal, as guests take in enchanting views of the moonlit bay. Tickets for the dinner cruise cost $69.50 per person. The Solaris leaves at 7 pm and returns to shore at 10 pm. After enjoying a lovely evening aboard the Solaris, guests will be ready to relax in our Destin bed and breakfast. With complimentary wine and chocolates upon arrival, a private beach, and balconies overlooking the Gulf of Mexico, it is easy to see why the Henderson Park Inn was voted the most romantic hotel in North America. Visit our Rooms and Rates page to find the perfect suite for your next Destin vacation!